If you've browsed my website and publications, you'll notice that I talk about the use of salt...a lot. I'm not referring to the salt we use for cooking and flavor. Dietary salt is a necessary nutrient; though is often overused. The salt I refer to are Cell salts and Epsom salts. If you're not taking advantage of these products to improve your health and well-being, you're missing out on safe, effective, therapeutic care at an affordable price. I soak in an Epsom salt bath regularly, in fact, it's one of my 4 Proven Methods to Manage Chronic Pain. Cell salts are made up of 12 minerals that are essential to the health of our body. These 12 salts are homeopathic remedies that stimulate healing mechanisms at the cellular level, and can restore mineral imbalances. My physician advised me to use Hyland's brand Bioplasma cell salts while I recovered from all 3 of my hip replacement surgeries. I experienced amazing results. There are no negative side effects, they do not react with medication making them safe to use, and they are easily accessible in stores or online. Cell salts can be used to improve bone health, ease depression, tend skin problems, aid digestion, reduce swelling, improve heart health, and eliminate muscle spasms. Investigate the use of cell salts and speak to your doctor. Check out this resource shown. David Card's book discusses the history and use of cell salts, plus includes a case study and client testimonials. 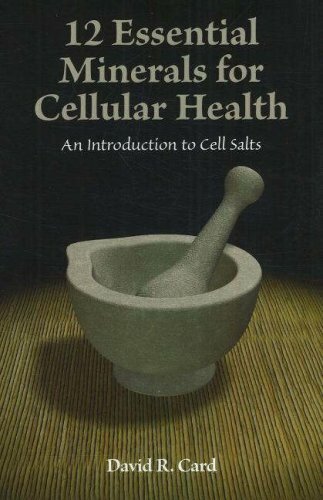 I own this book and refer to it often, Read more about cell salts and how to incorporate them into your wellness routine here.